Let your Computer say Welcome on startup! As of most tutorial written in this website, this tutorial will also not need any software. 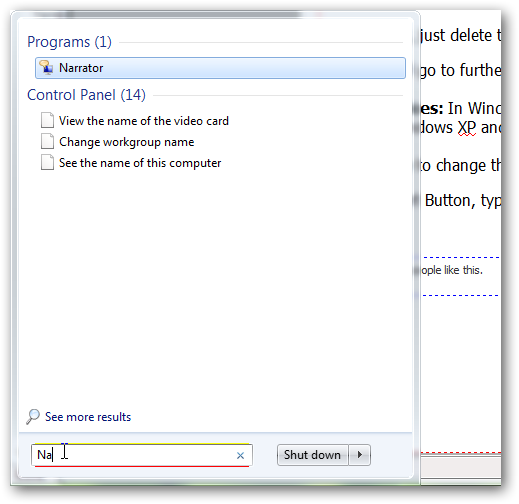 After reading this tutorial you will able to make your Windows 7 PC talk and greet you on every start up in the way you like. We will make a VB script and place it in Windows 7 Start up folder. There after, every time you log in, a voice will greet you after the start up sound (if enabled). Now, change my name to yours inside the code. In-fact, you can change and place any sentence within the quotation mark in the code. I have tested, it works fine upto 5 words. You can change the spelling, add space, punctuation etc to make it more realistic. For example, I want to hear my name as “Oh-bhi-shake” ; so I will write there “Oh bhi shake”. Just restart the computer and you will hear the voice! To disable it, just delete the file. Now, we will go to further details. 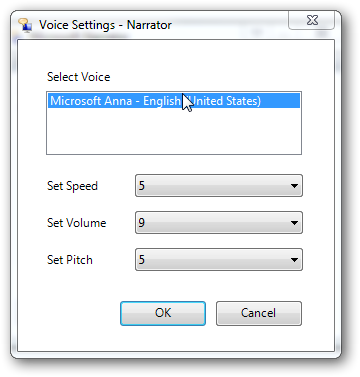 Type of voices: In Windows 8, Windows 7 and Windows Vista, the default female voice is Anna. In Windows XP and 2000 its Sam. 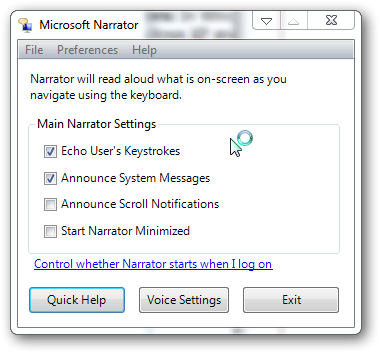 There is way to change the settings of this default voice in Windows 7 and Vista too. There are third party voices available for installation, the world’s quality best is if of Ket, but not available outside bulk purchase. Quality wise, Anna is next to it. .Pause = ThisValue // pause speaking .resume = ThisValue // resume after pause .Rate = ThisValue // speed of spoken words. The larger number, the faster pitch. .Voice = ThisValue // If multiple exist on machine, say Sam and Anna are available, you can set any one. .Volume = ThisValue // Already explained. .WaitUntilDone = ThisValue // wait until done “ Voice will wait still all the services loads, i.e. the system is completely ready. .Rate = ThisValue // speed of spoken words. The larger number, the faster pitch. .Voice = ThisValue // If multiple exist on machine, say Sam and Anna are available, you can set any one. .Volume = ThisValue // Already explained. .WaitUntilDone = ThisValue // wait until done “ Voice will wait still all the services loads, i.e. the system is completely ready. This article Let your Computer say Welcome on startup was first published on a free website from where we migrated later to this domain. The number of social shares can not be really counted – the old website had no social sharing button! Google Plus, Pinterest were not even ‘discovered’ ! This article Let your Computer say Welcome on startup was written for a person who is no longer is within us. We do not write on Microsoft Windows anymore. 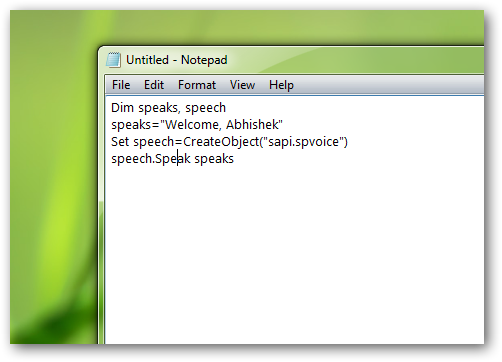 You can read advanced guide like Text to Speech Server on Cloud Platform. This Article Has Been Shared 5788 Times! Talking Calculator in right click context menu without any software for your Windows 7 or any version of Windows PC. I understood what you want to say, you want three or four sets of sentences (or phrase) like “Hello Chris, Welcome to Windows 7” ; “You are welcome, Chriss” ; “Hi Chriss ! This is Anna of Windows 7” and it will be randomly played during startup (as like songs in media players do in random mode). Right? I like the idea :) I have to look a bit to tweak to such level (if at all possible). Definitely will look and update if I can create something like that. Hi, thanks for sharing this idea. but if you can guide me on how to replace the Sapi’s voice with my default screen reader’s voice i.e., Eloquence, then it would be great. Cite this article as: Abhishek Ghosh, "Let your Computer say Welcome on startup," in The Customize Windows, October 18, 2010, April 24, 2019, https://thecustomizewindows.com/2010/10/let-your-computer-say-welcome-on-startup/.